Courtesy of North Coast Repertory Theatre. Rapier and wit from Amanda Slinkard and David Hamilton. The traveling stage family was once a commonplace American archetype, from high classical theater to Shakespearean companies taking dusty journeys around the 19th-century frontier, and then onto the scrappy times of the vaudeville circuit and beyond. From the esteemed Barrymore family, its descendants alive and tweeting to this day, to the semi-fictionalized mother and daughters of the magnificent Gypsy to the tragically haunted Tyrone clan of Eugene O'Neill's A Long Day's Journey Into Night, it's not so much the onstage part, but what goes on in dressing rooms and at happy hours and on trips along the highways and byways that is the stuff of good drama and comedy. With the North Coast Repertory Theatre's Moon Over Buffalo, it's into the comic half of that sphere that we are quickly drawn. Tony Award-winner Ken Ludwig wrote Buffalo in 1996 and it made its debut on Broadway, aided by his love for and a knack for understanding all the machinations of putting on a show. So here's the setup, as they used to say: In 1953 Buffalo — pegged by one of the characters as "Scranton without the charm" — we quickly meet George and Charlotte Hay, middle-aged, married actors quibbling between themselves while they tackle local repertory productions. George (David Hamilton, channeling the comic chops of Kevin Kline in the best ways possible) seems to be happy doing Cyrano in these less-than-glamorous locales, while Charlotte (Jacqui Cain, seen recently in Death by Design) is less than enthused when her suspicions are confirmed that George has managed to get Eileen (Sara Krause), a younger ingénue in their cast, with child. Also among the family in the backstage (and nearby) environs are George's hard of hearing mother, Ethel (Toodie Boll), and daughter Roz (Amanda Slinkard), who has broken the news that she is marrying a TV weatherman (Anders Carlson) instead of long-suffering stage manager Paul (area theater vet Evan Needham, who blessedly seems to be on stage everywhere lately). What kicks the plot into some acceleration is the news that famed director Frank Capra will be in the audience for the night's performance, possibly looking for a lead for his film of The Scarlet Pimpernel. George and Charlotte switch into high gear, Roz sidelines the news about her marriage to help manage the semi-drunken family mayhem that follows and other bits of business fall into place. Moon Over Buffalo falls perfectly into and embraces the genre of the door-slamming, zany bedroom farce. Director Scott Malcolm's cast — most notably Hamilton and Sinkard — and production work well off what's frankly kind of "meh" material. Rather than starting off strong and peaking too early, the production builds up steam from a slow start. The first act is burdened with some exposition that drags and some Ethel hearing-aid jokes fall so flat that I might've heard ladybugs moving around on the roof. Fortunately, the material and the manic energy build well. This sub-genre of green room mistaken identity and misunderstandings, dating famously back to Michael Frayn's Noises Off, finds a good groove when it gets going. And it picks up comic speed as it goes along, in everything from a great drunken running joke from George to some clamoring physical comedy which includes a misunderstanding that leads to a play-within-a-play mishmash of Cyrano and Noel Coward's Private Lives, which itself is, for a few minutes, funnier than I could fairly describe. Ludwig's original play is pretty thin in places, so it's to the credit of all involved that it eventually launches off well. Oh, and I've been to both Buffalo and Scranton; I couldn't give a judgment on which has more charm. Basically, they're both just freezing. But with great corned beef. Moon Over Buffalo plays Fridays and Saturdays at 8 p.m., with a special Aug. 11 show at 8 p.m. through Aug. 13, with Sunday matinees July 31 and Aug. 7 at 2 p.m. For more information, call 442-6278 or visit www.ncrt.net. Five Lesbians Eating a Quiche serves up biting social commentary Thursday, Friday and Saturday nights through July 30 at Redwood Curtain Theatre. The 1950s period comedy packs some punch with well-acted characters as the stiflingly polite ladies' club meeting is interrupted by an atomic alert. Call 443-7688 or visit www.redwoodcurtain.com. Tales of a Sexual Tomboy stops for a two-night stand at the Arcata Playhouse Aug. 5 and 6 at 8 p.m. Joyful Raven's one-woman comedy follows a young woman's romantic escapades as she stumbles into her own. Call 822-1575 or visit www.arcataplayhouse.org. 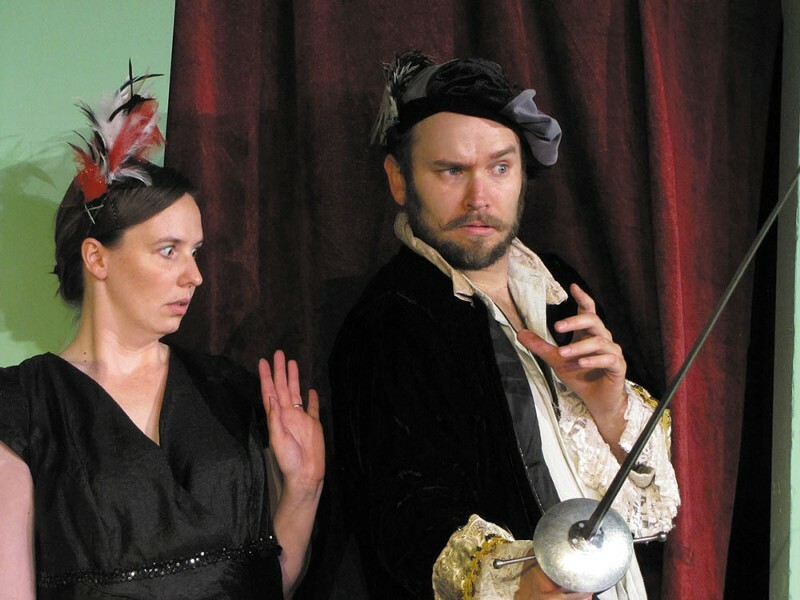 Plays in the Park shakes up Redwood Park with A Roaring Girl, the tale of feral female Moll Cutpurse, who rattles 17th century London with her sword fighting and hard partying. Runs Aug. 19 through Sept. 10. Call 822-5951 or visit www.cityofarcata.org.